I just wanted to say good work on your neural net code and articles/tutorials. I study Theoretical Neuroscience and Artificial Intelligence as a PhD in England and I found I have very many similar interests to you (I used to run a CS 1.5/1.6 league in the UK called CSGN). I come to the field of neural networks from a biological and psychological background, so the coding is my main obstacle. I mainly work with competitive networks (and Spatial Orientated Maps) for my modelling, so familiarising myself with the code for a back-prop net here was very useful! I’m really glad you found it useful! As long as at least one person found it useful, then I’ve succeeded at what I wanted to do. haha, a bit off topic, man i miss playing competitive CS! Same, although it is only as good as the people you are playing with. I used to have shed loads of fun with the other 4/5 members of my team when I played. Without them it was enjoyable, but no where near as much! Hey, your project looks fantastic. I need a neural net for my final year project, to interpret shapes read in through a wiimote to enable gesture control. Is there any chance of getting a VS 2005 version? gradient descent is the name of the weight update technique, the errors calculated are used in the update of the weights. As such i dont understand your question, also what dooe Tp and Op signify. i can’t figure out how to use the outputted weights with the actual nn. how can i instatiate the nn with my trained weights to get my nn output? PS: You’re really cute !!!!!!!! Is patch for compile in Linux. Wow! Thanks Ricardo, that’s pretty awesome! i saw it in bits & pieces while reading, it was dreadfully boring & the females on the show did not seem to represent any kind of beauty, clad, semiclad or inner. Just found a bug in neuralNetwork::loadWeights, delete cstr instead of delete cstr. which artificial neural network algorithm we need to use to classify water pollution. I am not going to give you code past what is on my blog. It is your project so do it yourself. I think the tutorials on this site and the web are more than sufficient for you to figure it out. I am not going to do your work for you. Jeeze you sound so rude. Plus your solution is really easy. Go read something. each neuron has input,output and error. while inputs is the array of inputs ive use to train the net. weightwithme is the coneection between the current neuron and the neuron from the prevois layer. for every neuron in the next layer-neuron.error*weightwithme. All your questions are covered by my NN tutorial posts, please read them. There are two neural network code examples on this blog and I’m sure there are dozens more on the web. hi sir,i am from india.can u please provide me a code to implement artificial neural network for rainfall forecasting using back propogation algo.i wud be really indebted to u .i hav to submit it on 21st september.thanx in advance. Just want to say your article is as surprising. The clarity for your publish is simply excellent and that i can assume you are knowledgeable in this subject. Well along with your permission allow me to take hold of your RSS feed to keep up to date with approaching post. Thank you one million and please continue the rewarding work. the webb visitors, who are wishing for blogging. Thanks for the code. I am taking the Coursera Machine learning course which uses Octave to teach NNs. Since I already know C++, that’s one less thing I have to learn in order to experiment. thanks for share,i’m also trying to code in c++, but i don’t used to in c++,here is my code can anyone have some time to see my problem. here i’m using gradient descent rule and delta rule, I is given value,and O is target value,in this code there are many syntax error,i need to find error. I am iOS developer and ported your code to Xcode (Mac). I hope you don’t mind, just let me know if you have something against it (I kept your credits in the source files). 1. 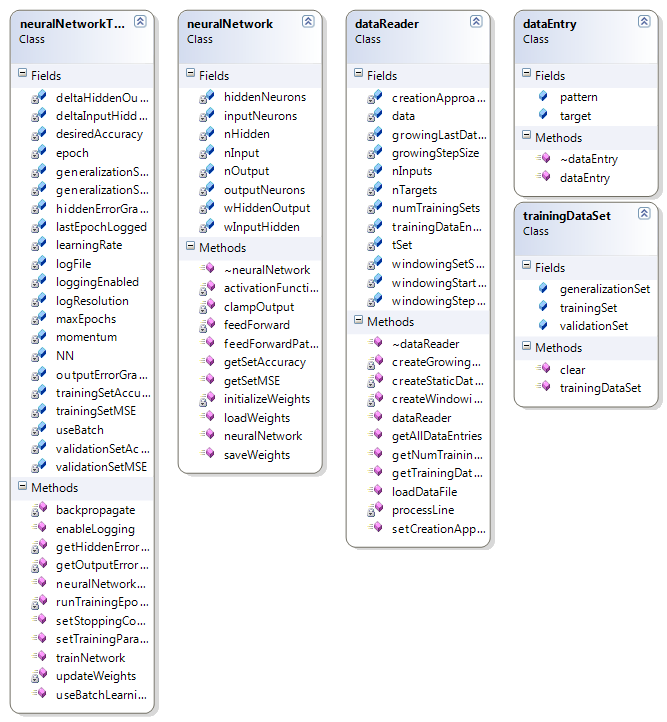 Tidied up neural network class and moved all methods related to training to the trainer class. 2. Changed memory allocation methods a bit (used malloc, but preparing to memalign it for later GPU ports). 3. Removed zero-ing and initializeWeights code since former is actually not necessary (values are zero-ed out during feedForward anyway) and later is needed only when training (therefore moved to trainer class and when training starts). Please let me know if I made sore obvious mistakes here, but code seems to execute example training fine. thank you for sharing the code, it has been very helpful to me. Christa,Thank you for sharing your wisdom. My question is, as an aspiring professional, how do I go about getting subtjces/models to pose for me so I can build up my portfolio? I have a small studio in my basement with a few lights and softboxes. I would love to specialize in photographing curvy girls. I’m a curvy girl myself so I know how it feels to not think yourself beautiful. I would like to bring that beautiful feeling to other women.Thanks again! guess thats in the code ?